CULTUS DEORUM ROMANORUM: Now a second lararium source! The reconstruction, revival and practice of the traditional religion of the Romans, a living pagan tradition. This tradition is sometimes called "Religio Romana" or "Roman Paganism". To have your event listed here, send details to "editor AT cultusdeorumromanorum DOT org". Meetup tag for Twitter, Flickr and YouTube: #CDRMup. Join us in our Facebook Group. Join our discussions on Facebook or Yahoo! and their images, soiled with black smoke. ~Horace, Odes, III, 6; A. S. Kline trans. Now a second lararium source! Sacred Source has supplied their "Penates Plaque" for years now. Almost 30 cm tall and made of resin, it is available in colors other than the basic "terracotta" for a fee. 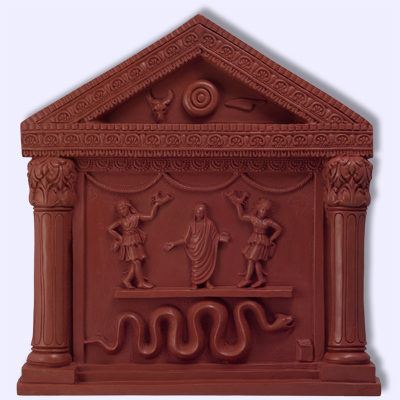 This plaque reproduces the look of the famous lararium from the House of the Vettii in Pompeii. At the time of writing, the price is US$52 plus at least US$10 for shipping, perhaps much more, depending on your shipping options and destination. For me, shipping would be over US$70, since I do not live in the USA. Now there is a new option for those wishing to buy an aedicula-style lararium. Appius Furius Lupus from Municipium Poltava in Sarmatia has begun production of wooden lararia. Furius Lupus is part of the same community that is building the Temple to Jupiter that I have mentioned here before. His product is roughly the same size as that of Sacred Source, nearly 30 cm tall, and it is also inspired by the lararium in the House of the Vetii. The design is much simpler than the Sacred Source plaque, with the aedicula itself in unfinished hardwood and the central image printed on paper. I have been told that the price will be US$30 and the shipping will be US$20. Also available will be farreum spelt cakes for those who do not make their own. I have a pre-production example that I use in my own lararium. I added a small marble slab in front. The slab sits on a metal bookend that stands up behind the aediculum and gives it greater stability. This is a problem with both the Sacred Source and the Furius Lupus products, although the wooden one does have more of a base than the resin one; I strongly recommend that both be secured in some way. Those who are handy with tools could also screw the Furius Lupus lararium to a simple wooden base from below. I am very happy with mine, even though it is, in effect, the prototype. It is very solid and well made, with excellent fit on all of the parts. The photo image is well printed, but I would keep direct sunlight off of it to prevent fading. Since it is made of hardwood, it is more durable than Sacred Source's resin product. It is also easy to modify, for those with some basic skills. For example, I plan to take advantage of the 4 cm overhang of the pediment by adding a few small hooks to the underside so that I can more easily attach garlands to it. I do not know how sales of the new lararium and farreum will be handled. As soon as I find out, I will report it here. The prototype looks pretty awesome. I'm gonna have to save up for one. Add your Cultus event here! You can also get your own Meetup gadgets for your site, or join an existing event. Follow this Meetup Everywhere activity on Twitter at @cultusdeorum. The Meetup tag for Twitter, Flickr and YouTube: #CDRMup. Your Donations Help Build Temples! These shops support this site. Prepare for the monthly Kalends and Ides rituals. The gods exist and are essentially benevolent. A natural relationship unites people with the gods. Human relationship with the gods requires human action. The gods can communicate their will. We promote "religio" and "pietas" and we avoid "superstitio". "Religio" is the attitude that the gods are the benevolent partners of mortals in the management of the world, and that the prescribed rituals are the proper return for the help that is provided by the gods. "Pietas" is sincere diligence in fulfilling the requirements of the partnership with the gods and in honoring all obligations. In contrast, "superstitio" is any excessive and slavish behavior that is intended to placate the anger of the gods, or the desire to extract knowledge or power from the gods. Contact us at: editor AT cultusdeorumromanorum DOT org.